Intel has designed a new integrated graphics core that the company claims can improve the battery life of smartphones, tablets and laptops. Graphics can be power hungry and the new power-efficient core, when paired with a CPU, represents a leap in bringing down overall power consumption on chips, said Intel researcher Divya Kolar, in a blog entry. "This graphics core incorporates several new features that allow it to improve energy efficiency by 40 percent -- essentially giving longer battery life for the same performance or improving performance when you really need it," Kolar wrote. The graphics core was developed by Intel's researchers, and a paper about the technology is being presented at the International Solid State Circuits Conference in San Francisco this week. The graphics core was developed for Intel's latest chips made on the 22-nanometer manufacturing process, but the company did not provide a specific date on when the core would be in products. The core is being tested on a prototype chip in Intel's research labs. 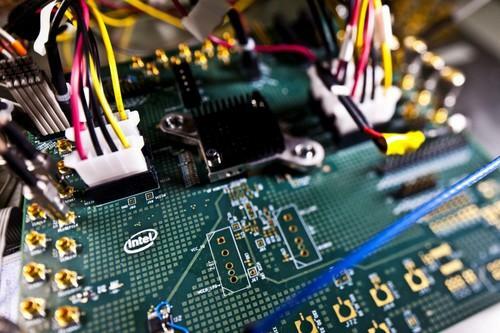 Technologies developed by Intel's researchers selectively trickle down to the company's commercial products. Graphics and processing technologies derived from Intel's Larrabee chip are now being used in integrated graphics cores and the Xeon Phi supercomputer chips, but it took years for those features to be integrated. Intel has been researching low-power circuitry and sleep states for years, and last year demonstrated a near-threshold voltage (NTV) CPU, which had the ability run at extremely low voltage levels. The CPU was able to operate a computer with the help of a light bulb, with power consumption dropping to as little as 280 millivolts when running at 3MHz, and up to 1.2 volts when running at around 1Ghz. Intel also said it was looking for ways to bring the near-threshold voltage technology to graphics processors. Intel has improved power efficiency in the new graphics core by concentrating power consumption in fewer circuits, which allows inactive parts to go to even lower voltage. The researchers focused voltage concentration in the memory arrays of the graphics core. Other tweaks include the introduction of a feature called "adaptive clocking," which involves boosting voltage regulators to automatically slow down the clock rates to prevent failures or errors. Power and performance is typically optimized in graphics cores by turning circuitry on and off, but errors can arise if voltage regulators do not function properly. Intel researchers added a feature in which voltage fluctuations are matched by slowing down the processor clock speed, which improves the power efficiency of the graphics core. Researchers also added of a separate voltage supply to manage power, which could allow more circuits to go into sleep state, resulting in power savings.